Twelfth Night Productions opened the modern American classic “Miracle on 34th Street” based on the story by Valentine Davies last weekend on the Kenyon Hall stage. Specific and unique to this production is the live radio broadcast presentation style. Characters lined up on stage facing the audience, old-fashioned microphones in front of them, and narrated the classic with wild animation. An organist played in and out of transitions, the kind of organ you used to hear at baseball games and even perhaps while listening to the radio in your living room once upon a time. In between scenes were commercial breaks and jingles. Clearly visible stage back two festively-dressed sound techs knocked wood blocks and xylophone keys to engineer the often comedic sound effects during the play. Another great addition to this show were the Mistletones, an a cappella ensemble of seven that sang Christmas tunes before, during intermission, and after, which contributed caroling spirit during the play’s unfolding. “Miracle on 34th Street” is about the re-budding hope and imagination of a young girl whose frighteningly adult attitudes threaten Christmas spirit . Little Susan Walker, played by returning actress Rachelle Henry whose, is pragmatic as ever during Christmastime, much to the surprise of self-proclaimed Kris Kringle himself. Santa Claus is not real as far as Susan is concerned and the idea of a Christmas miracle that would grant her the house she has always wanted for her and her mother is just short of irrational. Does she dare believe? Newfound family friend Kris Kringle encourages it absolutely. Played endearingly by John Ruoff who also wrote bonus feature “The Case of the Missing Mistletoe,” Kris Kringle defends his existence in court to save Christmas for Susan and give her the gift she has longed for. Overall the play was really well done, including the bonus feature “The Case of the Missing Mistletoe,” another live radio play, featuring a curmudgeon of a man, aka Scrooge, who needs some help with Christmas cheer. Henry’s effusive portrayal of a young voice actress on the radio was charming; she handled the layers of actress playing actress playing Susan well. 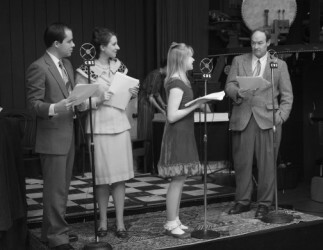 If you close your eyes during this production you won’t miss a beat because all of the components – the sound effects, the organ, the commercials, and the Mistletones – work together successfully to recreate the live radio experience of the 1940’s and 50’s.